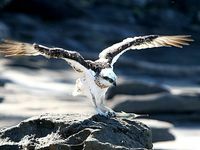 Sunshine Coast photographer Nicola Brander was privileged to capture this osprey in action at Happy Valley near Caloundra. THEY say the early bird gets the worm. When it comes to this amazing scene, it was a case of the patient photographer gets the shot. 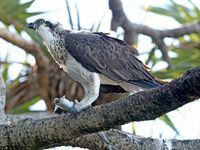 Sunshine Coast snapper Nicola Brander was driving home yesterday afternoon when she saw an osprey soaring in the sky over Caloundra. She spotted a couple of fishermen and, knowing how the birds love a feed, headed down to the rocks at Happy Valley but to no avail. 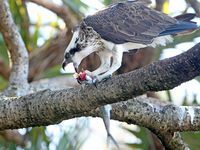 Just when she thought she would be going home with nothing, a large osprey landed about 10 metres away from her. She couldn’t believe her luck. It was not long before there were another four or five in the sky hovering above her. 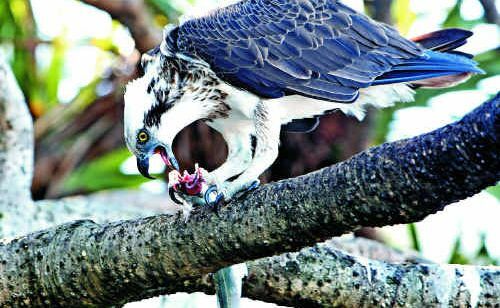 “I was a little bit uneasy,” she admitted, knowing how protective the birds can be of their catches. 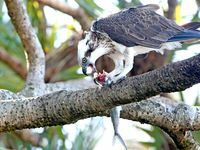 It was when the main bird flew into a tree that she could see it was devouring a fish and almost looking straight at the camera, moving its head from side to side.